Down the Rabbit Hole We Go...: Chinook or Spring? I'm going to be very Canadian in this post and talk entirely about weather. If winter was a person I would punch it in the gut and walk away. If winter was a person I would mean-girl it by tricking it into an all-carb diet. If winter was a person I would lay the best "Yo Mamma" insult known to mankind on it and then do a mic drop. Unfortunately, I am powerless to mentally or physically reduce winter to a melting, sniveling mess. There is a brief window, from November 1st to December 26th when I like the winter. Out comes the Christmas decorations and Christmas carol CD's. The kids and I stand in the front window watching the snow flakes gently fall, rejoicing in the fluffy whiteness and exclaiming excitedly over the Christmas lights throughout the city as we drive in the near constant darkness. But that all changes on December 26th. By the time the turkey leftovers are ready to be thrown in the trash, I'm about done with winter, and all it's forms of precipitation. Up until the end of January I still check the forecast, with a feeble hope for warmth and sunlight, but by the time February rolls around, I've given up on feeling the sun and heat again. 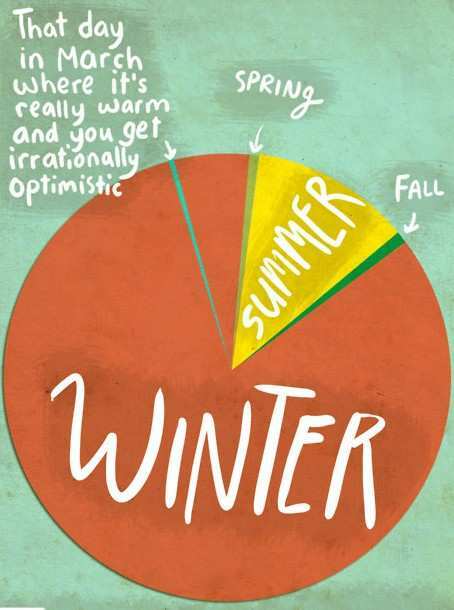 I hunker down, quit looking at forecasts, and just assume that it is always going to be cold, snowy, icy and miserable. I think the Winter Olympics are in February for a reason. It's an international effort to distract those of us in the Northern Climes as we try make it to the end of our 6-8 months of misery. Those of you who garden know that if you're going to start your own seeds, you need to start in March, but it's pretty hard to imagine the return of spring when all you see is white, snow, and ice. Here's to hoping that this week's Chinook is part of a warming trend and not just a blip. I heard that meteorologists are forecasting winter weather conditions until at least the middle of April. Remind me of this feeling when it's +35° this summer so that I don't complain about the heat then.